To begin immediate discussions, complete and submit the Confidential profile. GRAVITY EXTREME ZONE (http://franchise.gravityextremezone.com) The one and only indoor adventure park of its kind featuring challenging, thrilling elements of fun—Guaranteed to bring out the inner child in people of all ages! GRAVITY EXTREME ZONE heightens your sense of excitement, brings a thrill down your spine and appeals to all ages, yet it’s so comfortable that parents who resist the urge to participate in the adventure with their children can relax in comfortable booths, enjoy a cup of cappacuino or sit in front of a large screen entertainment system to watch football. After thousands of man hours of working with experts from all around the world, creator Sameer Trehan’s vision of an adventure park of the future becomes a reality. Every experience guarantees heart pumping, adrenaline flowing new excitement! GRAVITY EXTREME ZONE appeals to both children and adults. In addition to the immensely popular elements in the activity zone, comfortable booths, large screen television for sports and a full-fledged refreshment area allows for quality social and family time. 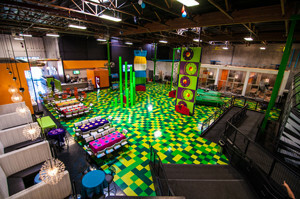 At GRAVITY EXTREME ZONE hosting a party is made so easy. Trained party hosts can organize an intimate party for just a few friends or for several hundred closest friends. Planning in detail all the activities, a wide range of food choices and all logistics to ensure that the event is simply out of this world. GRAVITY EXTREME ZONE is the ideal spot for team building events and corporate functions. The park has plenty of room for fun while our party hosts can take care of all the food and logistics so you can spend quality time with your friends and colleagues. GRAVITY EXTREME ZONE is ready to expand around the world! 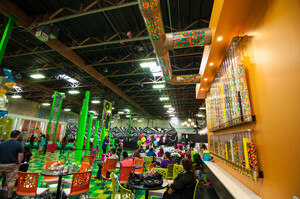 We have created a business model that ensures that customers keep coming back as Jason, a father who visits the park regularly says “Gravity Extreme Zone is the funnest place to be!” Our business has multiple revenue streams and a large repeat customer base creating a financially rewarding business. It is a business that gives you the opportunity to be the “Go To Place” in your community. The GRAVITY EXTREME ZONE park requires a space of 2,500 m2 -3,000 m2 with 6 meter ceiling height. If GRAVITY EXTREME ZONE is a business that excites you and you have the ability to make an investment of between US$1.5-2 Million, then please contact us by completing the form below. Only serious inquiries.